NEW BEDFORD, Mass. 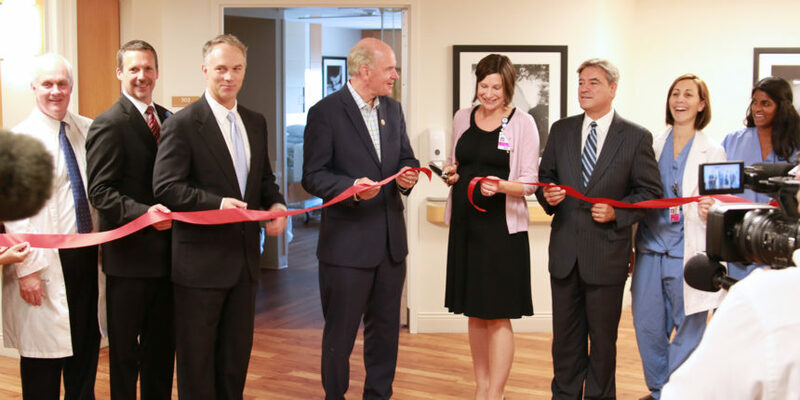 – As part of a $13.5 million renovation of the Family Centered Unit at St. Luke’s Hospital, Southcoast Health today unveiled its new, state-of-the-art maternity unit. Southcoast Health is the only provider of maternity services in the South Coast region. Each year nearly 3,500 babies are delivered between its three hospitals — Charlton Memorial Hospital in Fall River, St. Luke’s Hospital in New Bedford and Tobey Hospital in Wareham – with 1,400 of those births taking place at St. Luke’s. Maternity services at all three sites offer a family-centered approach that provides the right combination of compassionate care and the latest technology. The newly renovated area includes 16 post-partum private rooms and a state-of-the-art Level II nursery. The entire floor was designed with the assistance and input of Southcoast physicians and staff with room features that include private bathrooms with showers, are extremely spacious. The unit can accommodate overnight visitors so mothers, babies and their partners can spend time together as a family right from the start. The rooms are also equipped with the latest technology so staff can provide the best care at the bedside. Within the unit there are dedicated areas for family meetings with social services, hearing screenings, lactation services and neonatology prenatal consults. There is an expanded five-zone infant security system installed throughout the entire third floor of the hospital, and is further secured with a centralized reception area and security check-point. St. Luke’s and Charlton Memorial are the only hospitals in the region that offer Level II nurseries, a neonatal intensive care unit specializing in the care of ill or premature newborn infants. The St. Luke’s Level II nursery was designed to be in close proximity to mothers within the post-partum area. It offers more family space around the infant and incorporates equipment at the bedside. St. Luke’s also offers full-service operating rooms, surgeons, and a highly-skilled perioperative and critical care staff that can make the difference between a life-altering complication and a positive experience. Beginning with the opening of a new pediatric unit in 2013, this new post-partum unit is the second part of a four-phase project. The final two phases are expected to be completed in 2015. Those phases will include a new delivery suite with five dedicated labor and delivery rooms, three dedicated triage/labor rooms and two C-section rooms. The unit will also house a recovery area, three additional private post-partum rooms and additional medical/surgical beds. This new unit adds to the breadth of high-quality care available at Southcoast Health. This year Southcoast achieved the Healthgrades 2014 Maternity Care Excellence Award – the only hospitals in Massachusetts to do so. This unique distinction places Southcoast Health within the top 10 percent of all hospitals in the nation for exceptional care provided to mothers — during and after childbirth — and to their newborn children. Visit http://www.southcoast.org/maternity/ to learn more about maternity care at Southcoast Health. For additional details on the Maternity Care Excellence Award recipients, please see the complete Healthgrades Women’s Health Report 2014 at www.healthgrades.com/quality.